As you drive south on Oakland's Grand Avenue toward Lake Merritt, on the right hand side, you'll notice a beautiful exposed brick building. Its lines are symmetrical, and the roof is tiled with waves of red terra-cotta. There are beautiful wood beams framing street-side windows expansive from sidewalk skyward. 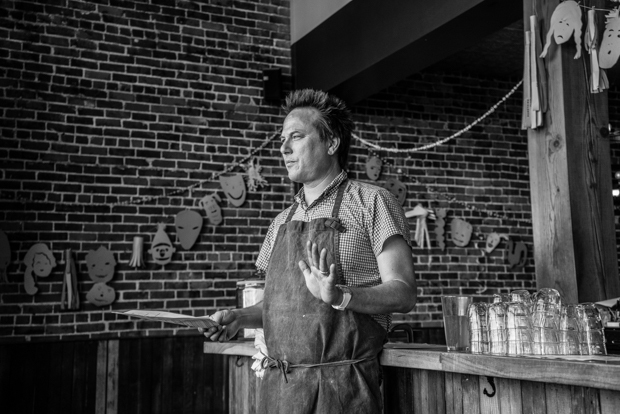 Camino is a special restaurant owned by chef Russell Moore and Allison Hopelain. It's a place that tells you a lot about the two of them through a whole range of details - some loud, others more quiet. 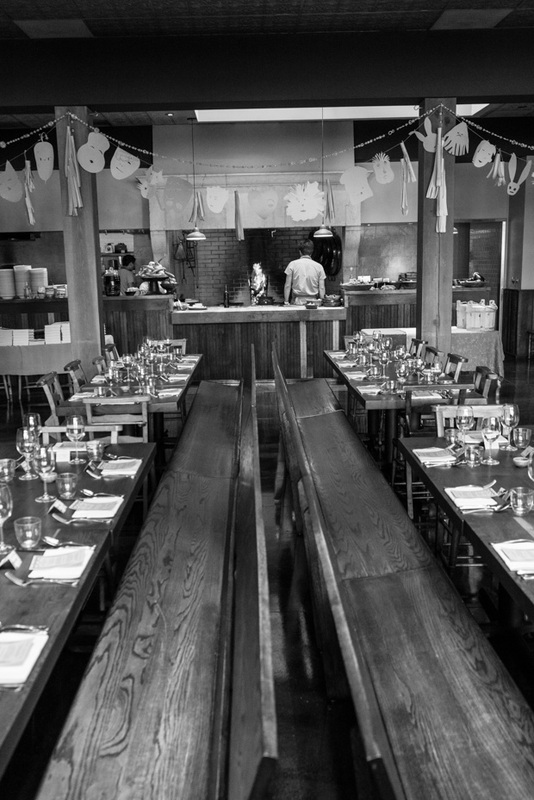 A wide open interior with long tables of family-style seating frames an open hearth where much of the cooking takes place. 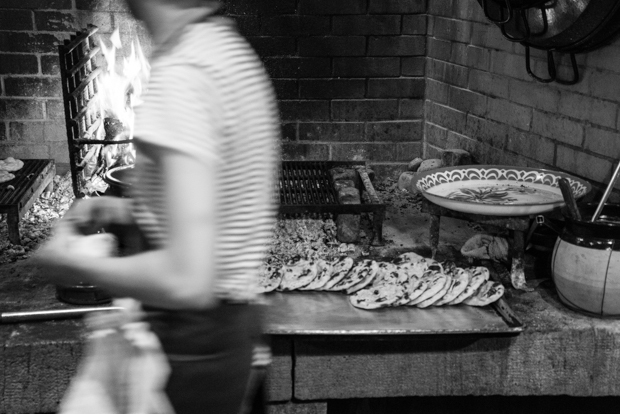 Camino is known for impeccably sourced ingredients made into meals prepared in open fire. 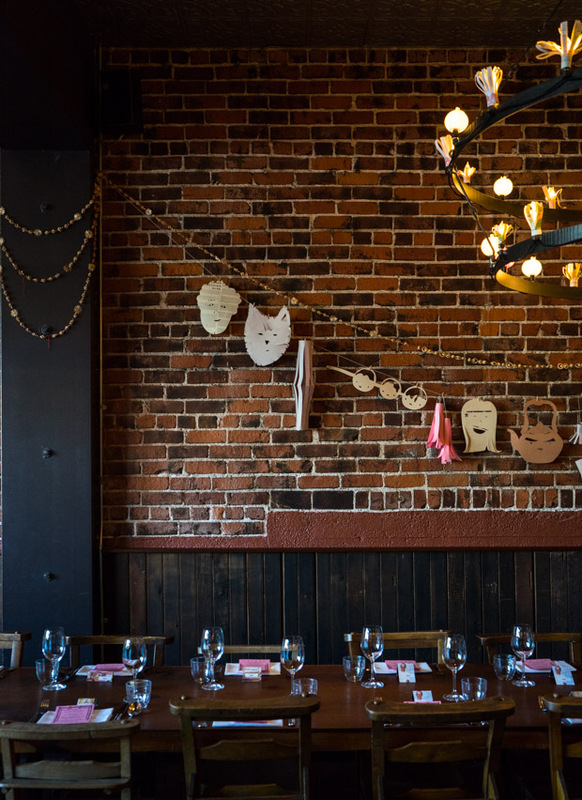 It's also known for having great style - you see it in everything from the food, to the cooking vessels, to the custom crown chandeliers, and the arches of hand-cut paper masks on the walls when I walked in the other night. 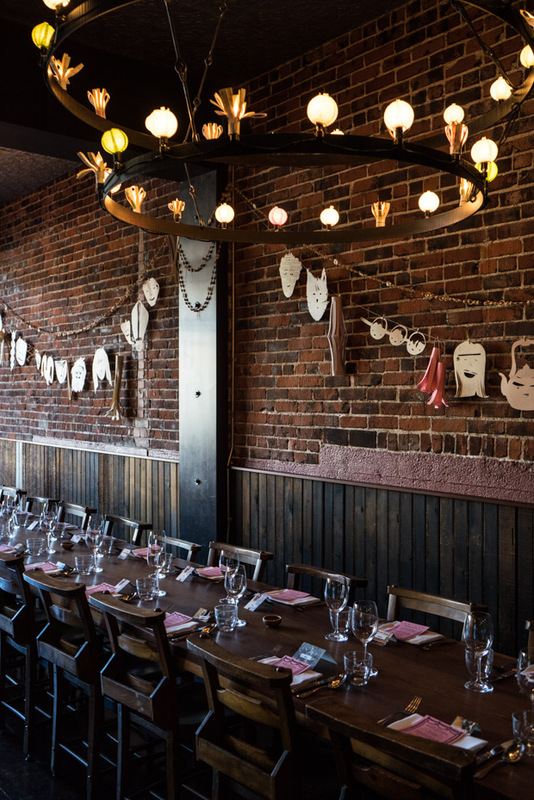 Russ and Allison hosted a dinner at Camino last week to celebrate the release of Near & Far. 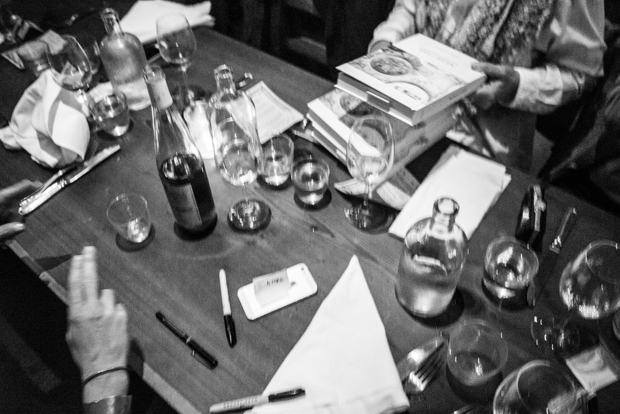 They do this sort of thing on occasion, where they host an author, and bring people together for a meal related to a (typically) newly released cookbook title. 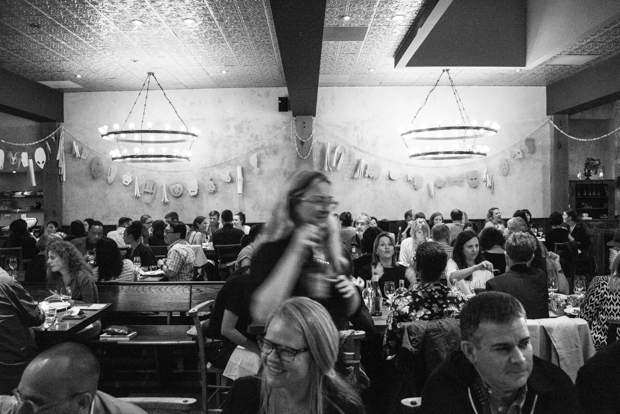 For an author, it's magic - to have a night where the Camino staff focuses on your recipes and cooking style, friends at every table. So, I wanted to share a few things today. First, some photos from that evening. Second, a recipe for Chicory Soup. It is one of my favorite recipes from Near & Far, and it was one I was worried people might skip over. When I saw that Russ was going to do a version of it - so thrilled. 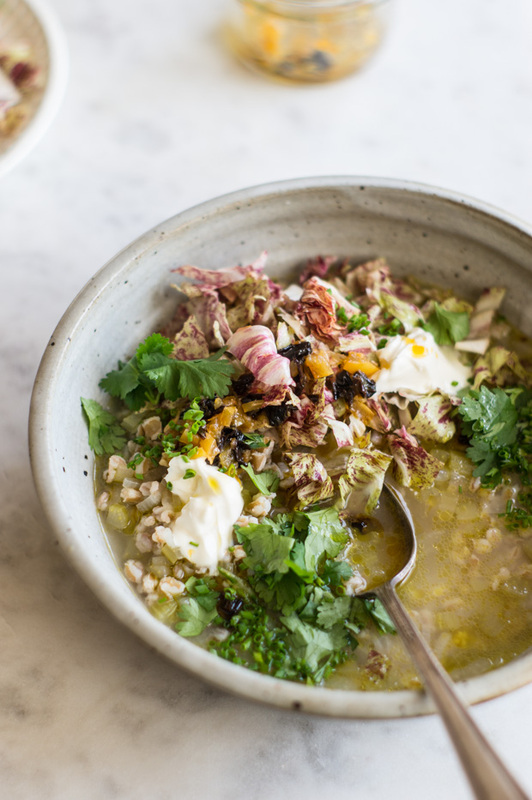 It's a brothy, restorative barley soup with chicories punctuated with flecks of preserved lemon, a bit of chile confetti, and a silky dollop of creme fraiche. I could eat it everyday with no complaints. 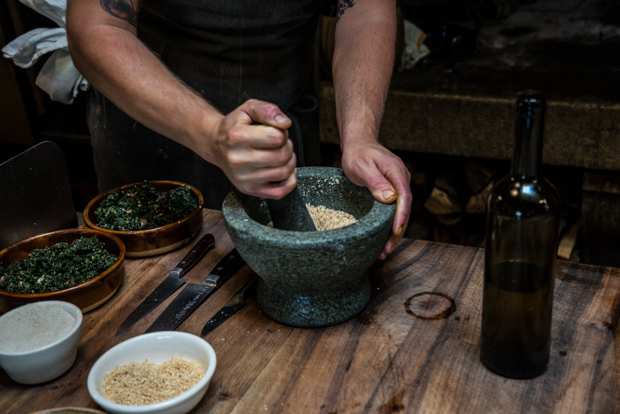 Russ sources and likes to cook with Anson Mill's whole farro piccolo, and did a version with that for the dinner. The flavor was so nice and pronounced. And you all know how much I like soba-yu (scroll forever)- whether you use barley or farro, this soup has some of that spirit woven in. 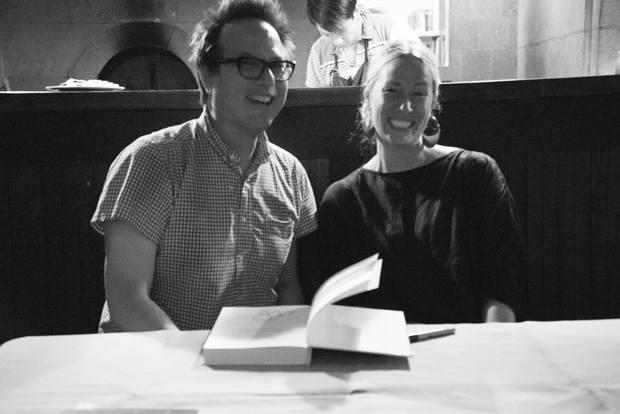 xo to anyone who grabbed my camera and took photos that night while I was signing books. 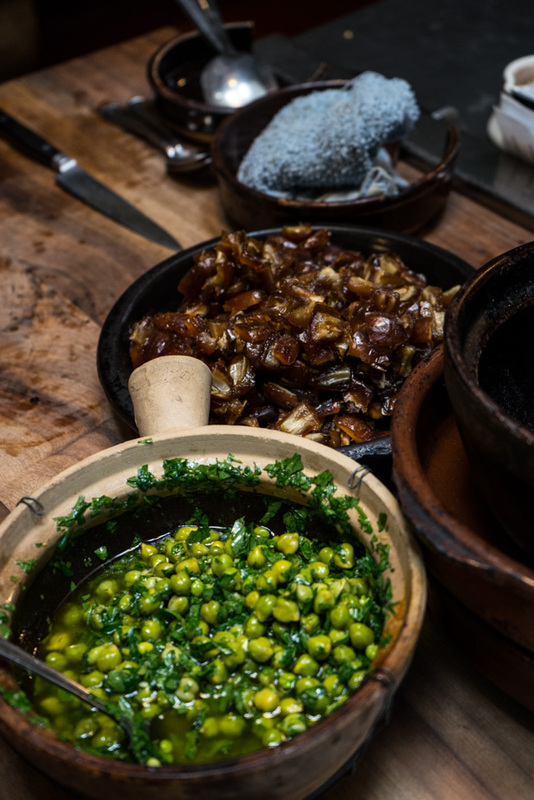 Mostly Wayne ;) Also, hop on the Camino mailing list to be notified of future dinners - they've hosted some of my favorite people in the past including David Lebovitz, Yotam Ottolenghi, Chad Robertson, Deborah Madison, and James Oseland. 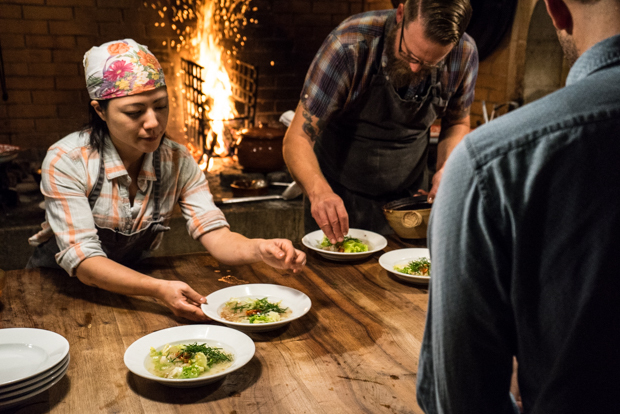 Next up for them is Hartwood with Eric Werner and Mya Henry. 7 tablespoons | 105 ml extra-virgin olive oil, plus more for serving. 1 medium onion, quartered and thinly sliced. 1 small whole preserved lemon, rinsed, seeded, and minced. 3 cups | 4 oz | 115 g chicory, cut into 11/2-inch | 4cm pieces. Crème fraîche, chopped cilantro, and/or chopped chives, to serve. To a large pot over medium heat, add 3 tablespoons of the olive oil, the onion, celery, and 21/2 teaspoons of salt. Stir frequently for 5 to 10 minutes, until the onions and celery are soft but not browned. Add the bay, thyme, and water and let simmer for about 20 minutes, until the vegetables are very tender. Stir in the cooked barley. Continue to simmer for an additional 10 to 20 minutes, until the starchy barley has slightly thickened the broth. Remove and discard the bay leaf and thyme sprigs. Taste again for seasoning, adjusting if necessary. While the soup is simmering, make a lemon-chile relish. Start by removing the stem, ribs, and seeds from the chile. Chop the chile into very small, irregular crumbles. You want bits that are not uniform, to lend a rustic quality to the final result. In a small pot over medium heat, combine the remaining 4 tablespoons of olive oil, the chile crumbles, and garlic. Tilt the pan so that the oil pools, toasting the chile, but taking care not to burn the garlic. After about 5 minutes the chile should be somewhat softened and its flavor will have infused the oil. Remove the pan from the heat, smash up the garlic pieces, and stir in the preserved lemon. 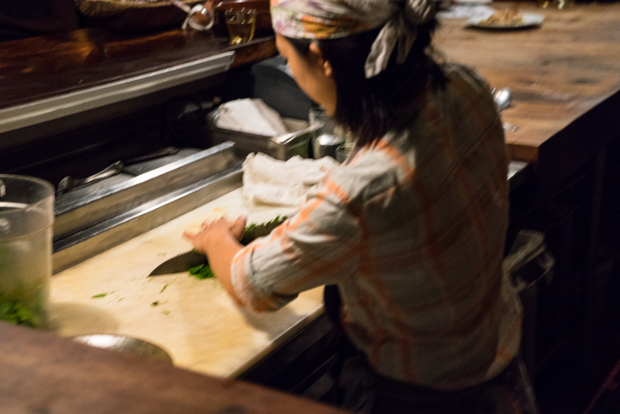 To serve, toss the chicory with a small splash of olive oil and a sprinkling of salt. 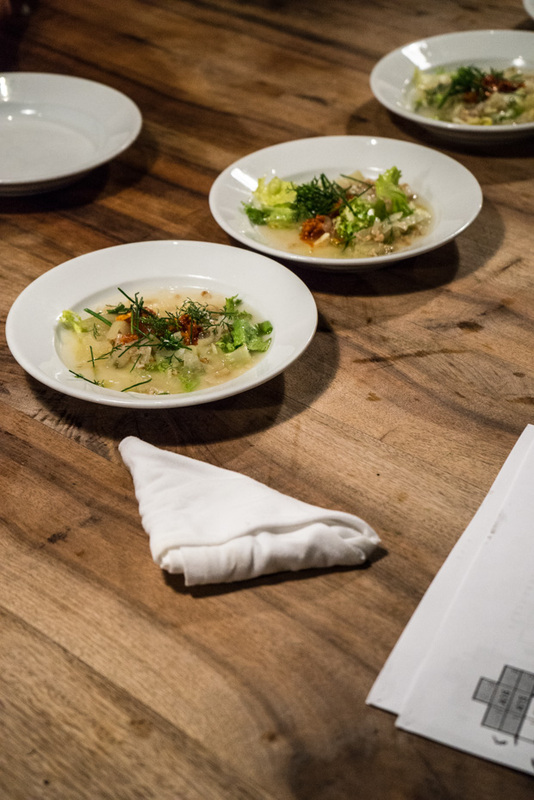 Ladle soup into individual bowls then top with the dressed chicory. Add small spoonfuls of lemon-ancho relish, dabs of crème fraîche, and lots of chopped cilantro and chives. All the helpful, essential Instant Pot links in one list. Links to accessories, videos, water test how-to, recipes, guides, etc. This is a noodle salad you'll crave every day. A radiant, color-flecked tangle of noodles, cabbage, shredded carrots, pickled sushi ginger, and an abundance of cilantro, basil, and scallions. It has tofu and peanuts, coconut, ginger, avocado, and hemp seeds. The dressing(!) - it's simple but strong, and steps in with an assertive spicy sriracha-lime punch. Ginger and garlic tempeh rice, folded into lime-spiked lettuce wraps with lots of herbs, cucumber, and carrots. A one-pan meal that comes together in no time!